The U.S. Attorney General is forever caught between competing demands: on one side, his political duties as cabinet appointee and adviser to the president; on the other, his quasi-judicial responsibilities as chief law officer of the nation. In theory the two sets of responsibilities coexist peacefully. In reality they often clash. In Conflicting Loyalties, political scientist Nancy Baker provides the first comprehensive analysis of the history and structure of the office of the U.S. Attorney General, an office that legal scholars have described as "schizophrenic." Her study documents how they have differed in their responses, seeing themselves either as advocates of the president or as neutral expounders of the law. Combining historical analysis with legal and political theory, Baker shows how this implicit conflict has evolved from the earliest days of the Republic, when the attorney general was primarily an adviser, to the present day, when he administers the huge bureaucracy of the Department of Justice. 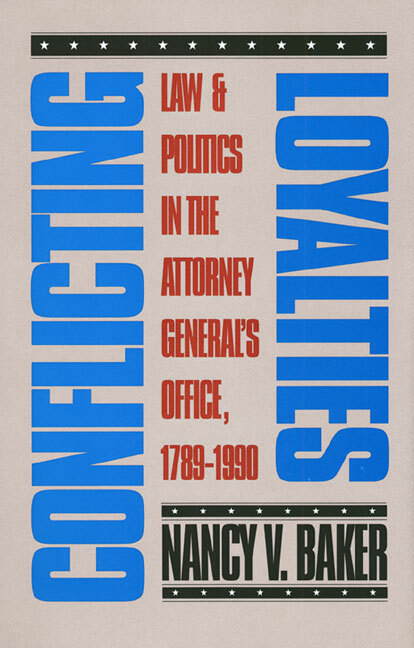 Using both archival materials and personal interviews, Baker analyzes how the seventy-five men who have held the post of attorney general have managed the conflict of loyalties. In particular, she focuses on Robert Kennedy, Edwin Meese, Elliot Richardson, Griffin Bell, Robert Jackson, Edward Levi, A. Mitchell Palmer, and Roger Taney. She also examines how the office has been affected by scandals in various administrations, including the Red scare of 1919-20, Teapot Dome, Watergate, and Iran-Contra. The book concludes with an exploration of arguments for reforming the office. Before she received her doctorate in political science in 1989, Nancy Baker was a journalist. Currently she is on the faculty at New Mexico State University. This is her first book.